It is always so much fun to watch a cat chase a toy around the house, especially one filled with catnip. 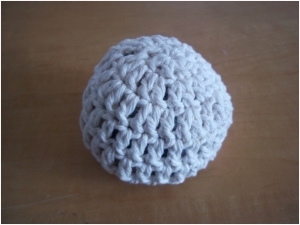 This particular toy can be made out of cotton or acrylic yarn, but I personally prefer the cotton yarn. It takes less than half an hour to crochet it, so your cat (and you) can be enjoying it in no time at all. To make your catnip pouch, fold the fabric square in half wrong sides together. Stitch almost all the way around using small hand stitches or by machine. Add the catnip then finish stitching. As this will be inside the toy, there is no need to turn the pouch. Once the catnip pouch is finished, you will be ready to make the ball. Ch 4 and join with a sl st to make a ring. Round 8: Ch 1; sl st in every second st and ch 1 st. Fasten off and hide yarn ends inside ball. Note: This pattern may also be used to make toys for babies. The ball will be worked the same, but the catnip pouch will be eliminated. To stimulate baby’s senses, use bright colors.